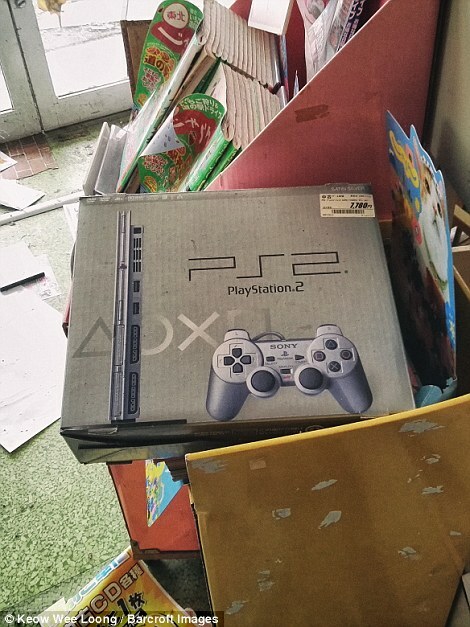 There was also an empty DVD shop, full of discs dating back to 2011 – a reminder of the 150,000 people were forced to leave. 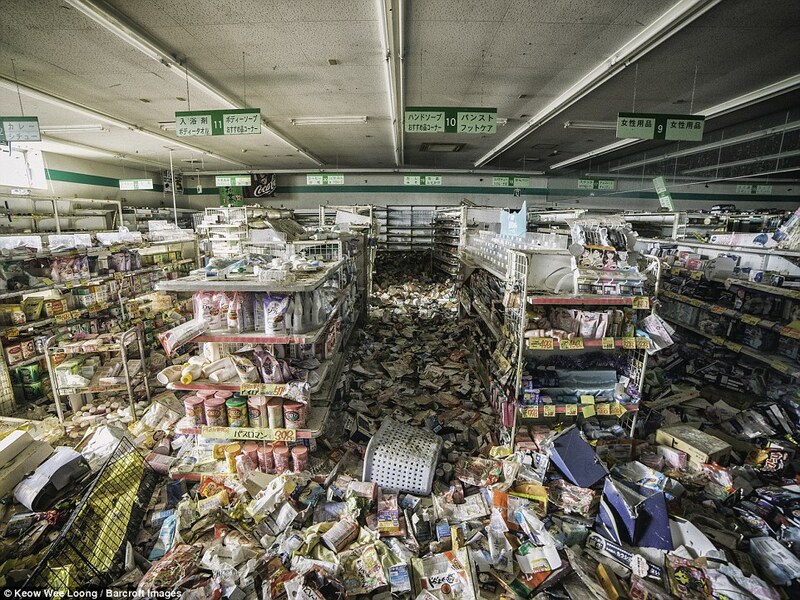 Among the locations Loong explored during his time inside Fukushima, there was an empty supermarket full of merchandise dating back to 2011. 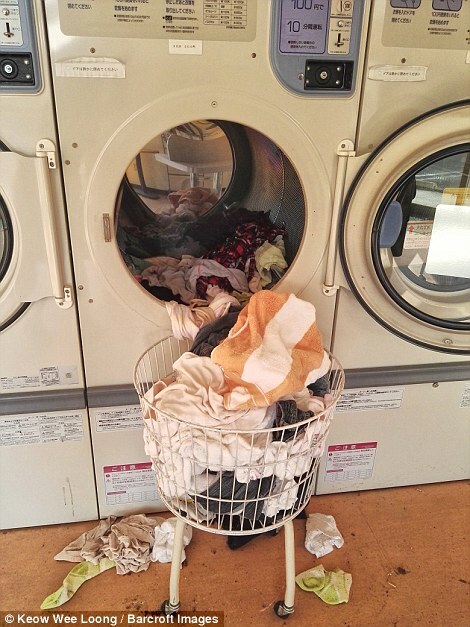 Clean laundry left half in washing machines show the panic that followed the disaster and there were plenty of valuables left untouched. 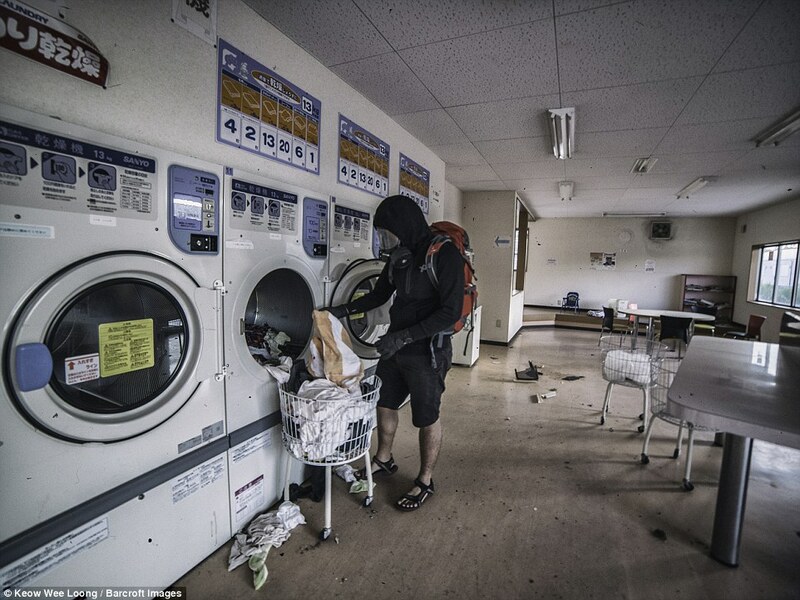 Wearing a gas mask but no other protective clothing, Loong, 27, visited four of the evacuated towns in Fukushima – Tomioka, Okuma, Namie and Futaba – in June this year with friends Sherena Ng and Koji Hori. They were evacuated after the disaster on March 11, 2011, when a 50ft wave swamped the sea wall at the nuclear power plant, sparking equipment failures and allowing radioactive materials to escape. 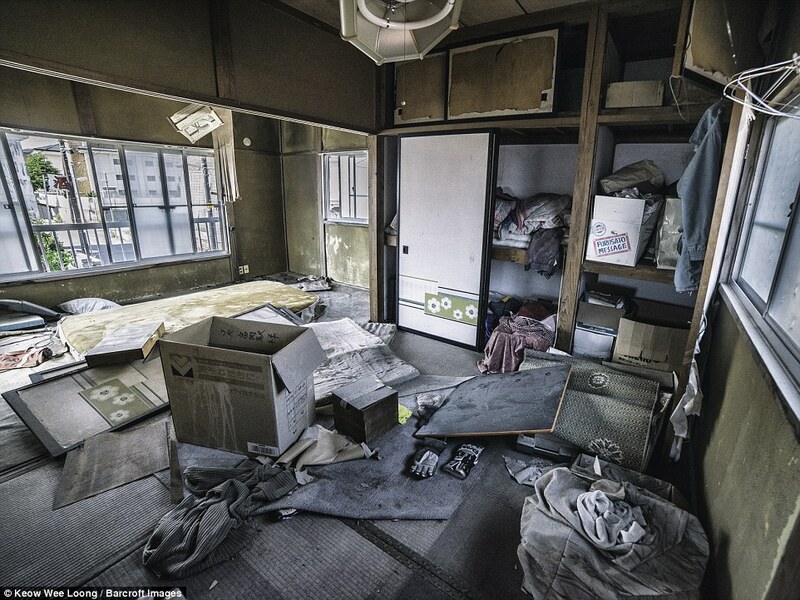 It was the worst nuclear disaster since Chernobyl and the towns have been completely untouched by humanity since then. 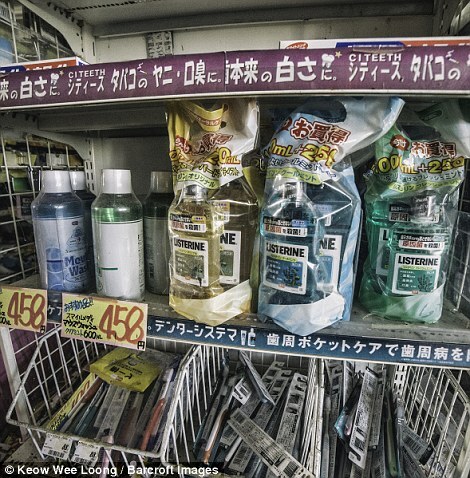 Loong’s images give an eerie insight into the panic that followed the disaster and show a city stuck in time as calendars remain on the same date, families’ clean washing is partially-removed from dryers and newspapers forever remain unsold. 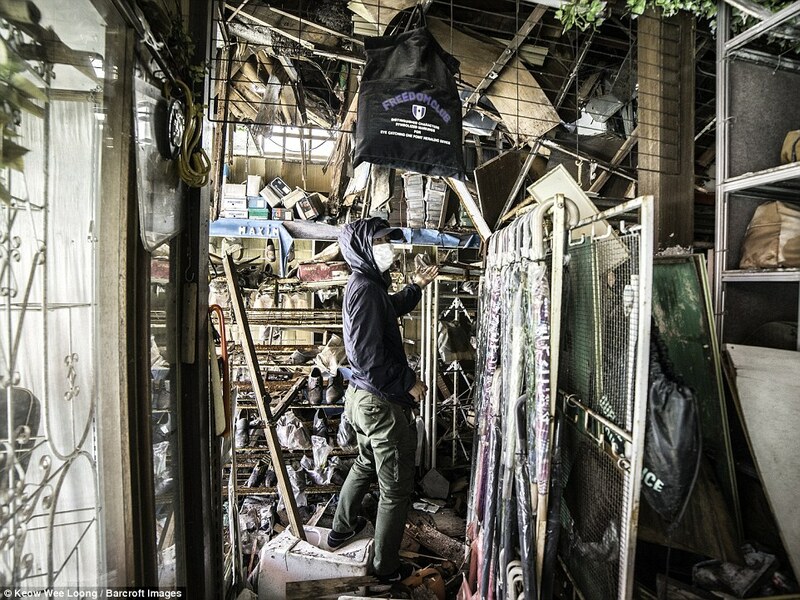 Malaysian-born Loong said: ‘The residents of these three towns in the red exclusion zone left so quickly they didn’t even pack or take anything valuable with them. 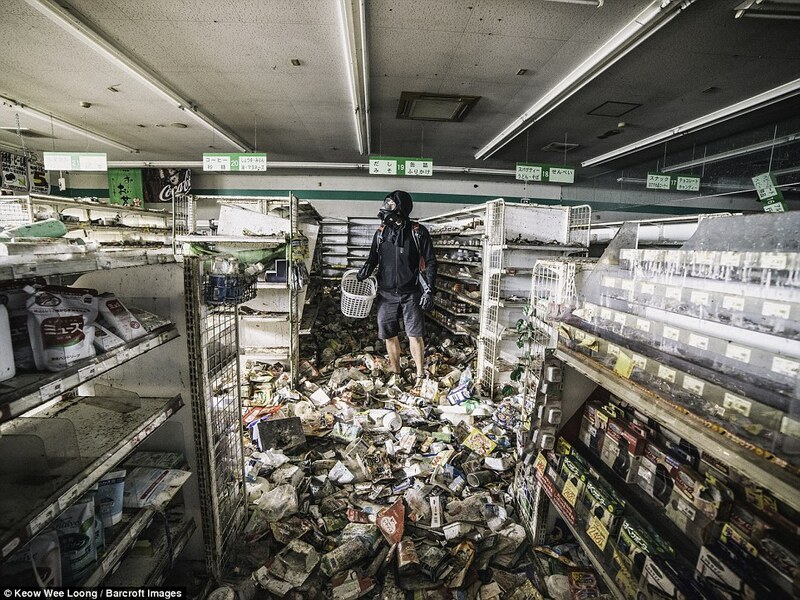 The urban explorers entered the so-called ‘red zone’ – the site of maximum radiation – in the middle of the night to avoid being caught by the police. 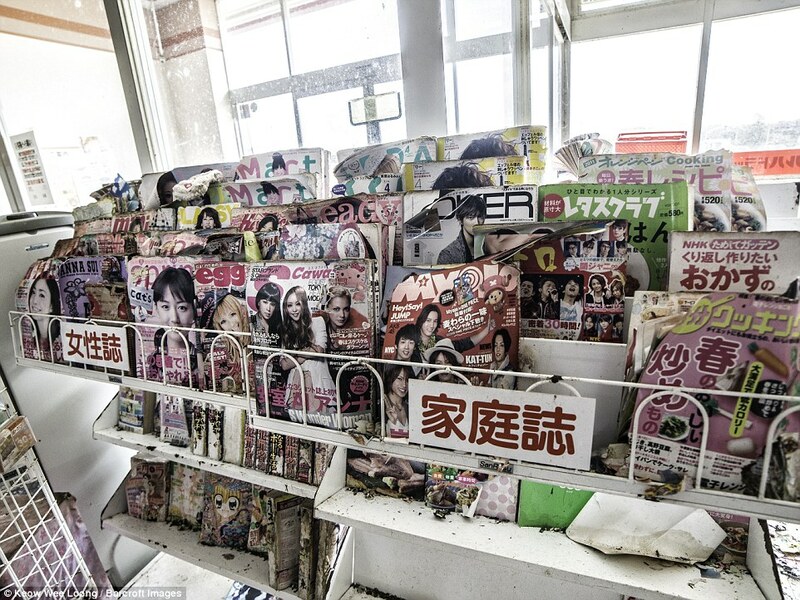 Loong added: ‘I even found money laying around the pachinko parlour, books dating back to 2011, gold and other valuables all still in place. Due to the high level of radiation, the adventurers only had a limited amount of time to explore all four towns and had to wear gas masks to protect themselves from the contaminated air. Loong explained: ‘The radiation level in the red zone could go as high as 4.8mSv – 6.5 mSv according to the reading on the electronic signboard on the road. 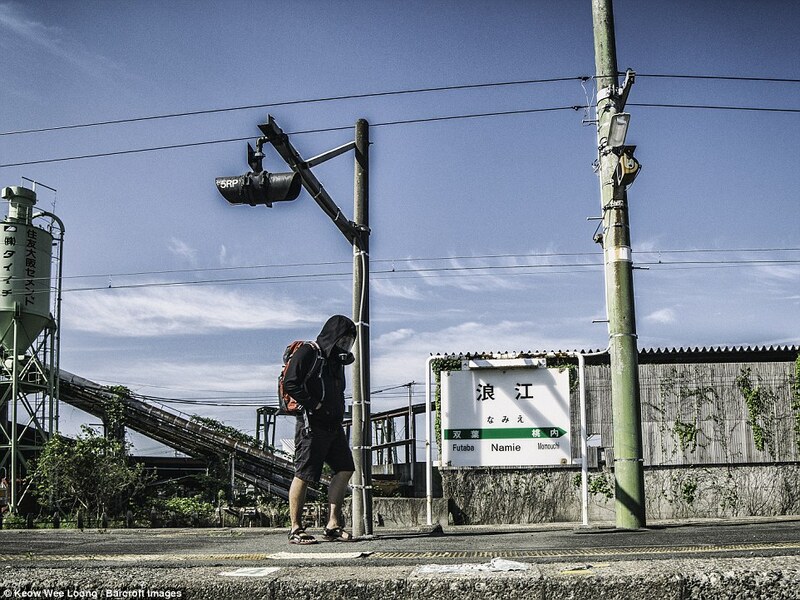 The urban explorers walked along an abandoned train station in Futaba, Fukushima, which was eerily devoid of life. 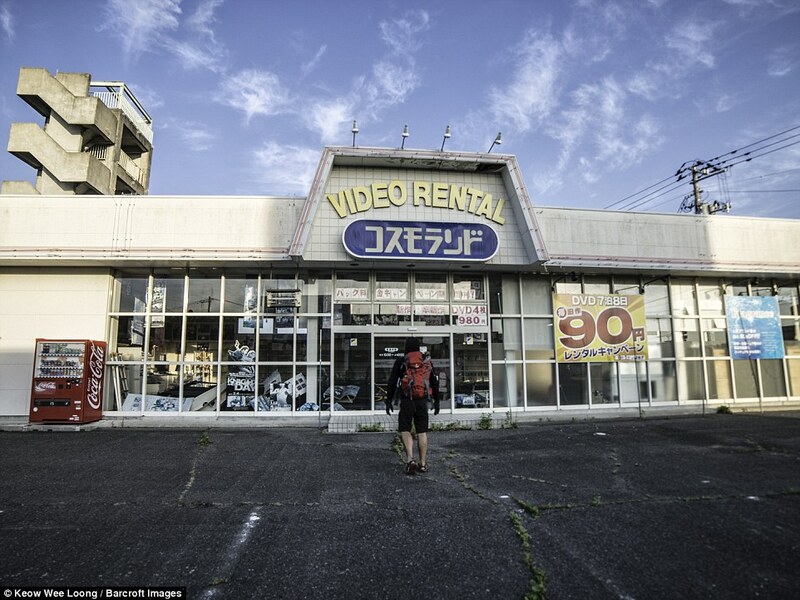 Among the locations Loong explored during his time there was an empty shopping centre with outlets full of merchandise dating back to 2011 – a reminder of the 150,000 people that were forced to leave the area following the disaster. 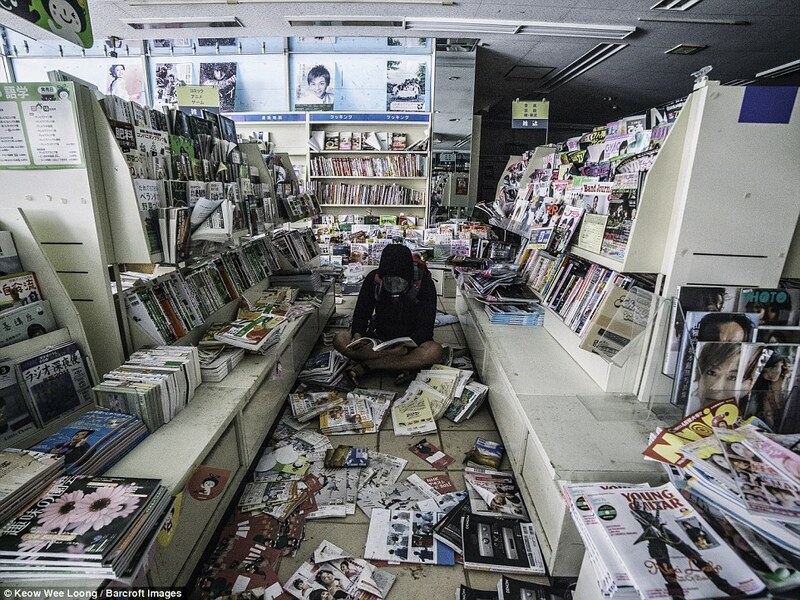 He said: ‘When I walked into the mall I felt an eerie silence, like time had frozen. The mall was completely empty with no people in it but all the merchandise in place and I could explore anywhere I wanted. 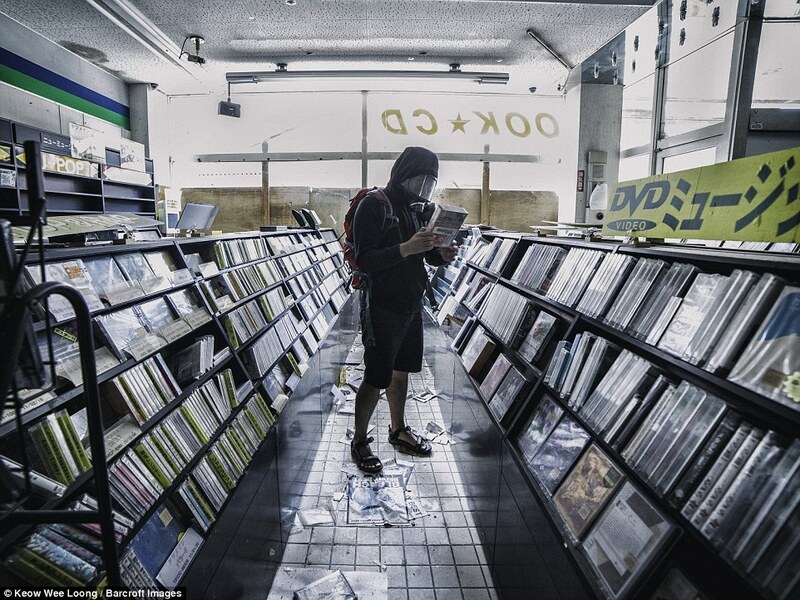 ‘I always had a childhood dream of going into a mall alone when it is empty, so my dream came true, it was like deja vu, everything is exactly the way it is since 2011, the books marked with 2011, DVD movies of 2011. 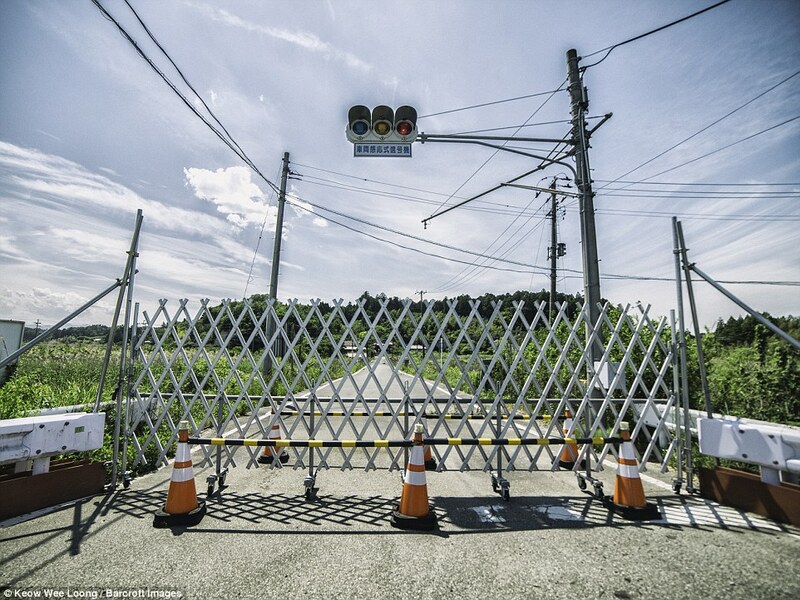 ‘This was one of the creepiest things I have ever seen, I have been to many places, but nothing like Fukushima, the traffic lights are still operating but there are no cars around. Advancing Justice — Asian Law Caucus is excited to announce a new fellowship for formerly incarcerated Asian Pacific Islanders. Too often, the movements against prisons and deportation are out of sync and ignore the intersectional experiences of people in both systems. Advocates often make decisions without inviting formerly incarcerated people into the conversation and without consulting people who are locked up. Through the Yuri Kochiyama Fellowship, we hope to begin changing that. By centering and building leadership among directly impacted people, we hope to support a movement led by incarcerated and formerly incarcerated people. Over the next several months, the first two Yuri Kochiyama Fellows will be using their experiences to advocate for changes to America’s incarceration and deportation systems. As people who have spent years in prison and immigration detention, their voices and leadership are sorely needed in the movement. We chose to name the fellowship after Yuri Kochiyama. She was a tireless political activist who dedicated her life to social justice and human rights for almost five decades. Yuri spent two years as a young adult in an internment camp for Japanese-Americans in Arkansas during World War II. Later in life, she worked with Malcolm X, the Harlem Parents Committee, the Black Panthers, the Young Lords and other groups. Throughout her life, she supported people in prison by exchanging letters, advocating for their release, and organizing support committees. Our first two Fellows will carry on Yuri’s legacy by using their experiences in prison and immigration detention to advocate for those still locked up. Their first advocacy project will be in support of a ballot measure that limits the ability of District Attorneys to charge children as adults. The reforms will keep thousands of children from being sent to prison for decades and from facing deportation for those crimes. Rajeshree Roy, a 2016 Yuri Kochiyama Fellow, was arrested at the age of fifteen for a robbery. Rather than receiving services as a survivor of childhood sexual abuse who was homeless, she was tried as an adult and sent to prison for fifteen years. She would later spend a year in immigration detention. Aelam Khensamphanh, a 2016 Yuri Kochiyama Fellow, fled war in Laos and came to the United States as a refugee when he was eight-years-old. His family was resettled in Modesto, a poor community plagued with violence. 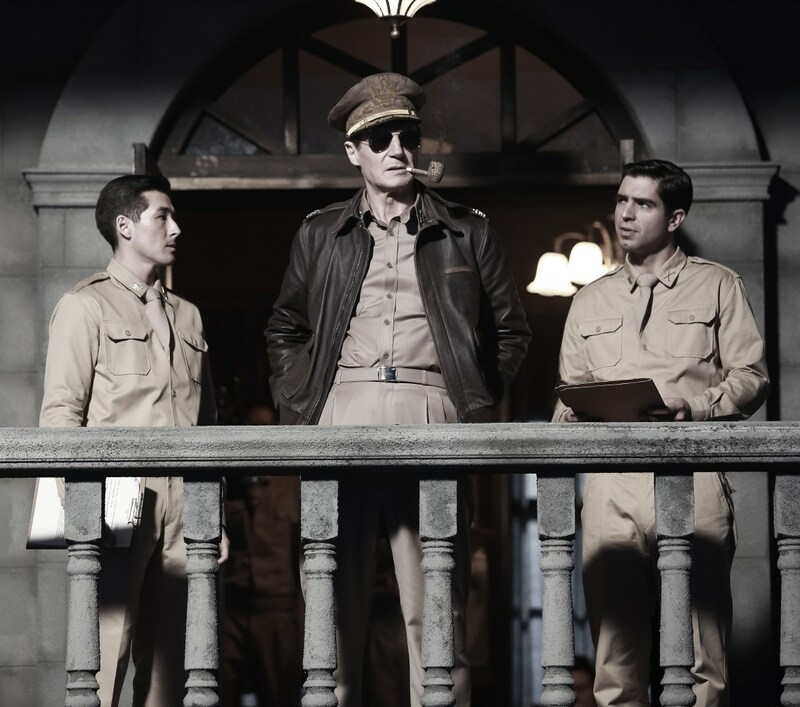 Unable to speak English and without language services, he struggled in school as a child. Attempting to fit in, he joined a gang at fifteen. After a shootout with a rival gang, he was sent to prison for life at the age of seventeen. While in prison, Aelam worked with the Squires Program to intervene with at-risk youth. After serving twenty-two years in prison, he spent months in immigration detention before being released earlier this year. Aelam and Rajeshree will be working to make sure that future generations of children will not go through the same cycle of trauma, incarceration, and deportation that they did. Japan Archives went live on June 30th and contains a treasure trove of information on modern Japanese history from the Bakumatsu through the Meiji and Taisho eras and up to the present day, covering everything from politics and economics to sport, nature, and the everyday life of the people. Who even needs museums anymore when you can now experience the most important events in the country’s history through photographs, posters, postcards, woodblock prints, and other visual media from the comfort of your own home. While only available in Japanese, the site is conveniently organized by time period and genre, making it user-friendly and easy to browse. There’s a wealth of historical media to sift through, and even if you can’t read the Japanese captions you can still enjoy the nostalgic images which bring the samurai and geisha of the past to vibrant life on your screen. And best of all, it’s all freely accessible!